Trilogies are not easy to pull off, ESPECIALLY when we’re dealing with a non-linear timeline. Just as fans will argue about their most favorite of the three, there will often be an uncomfortable conversation about which was the least memorable. 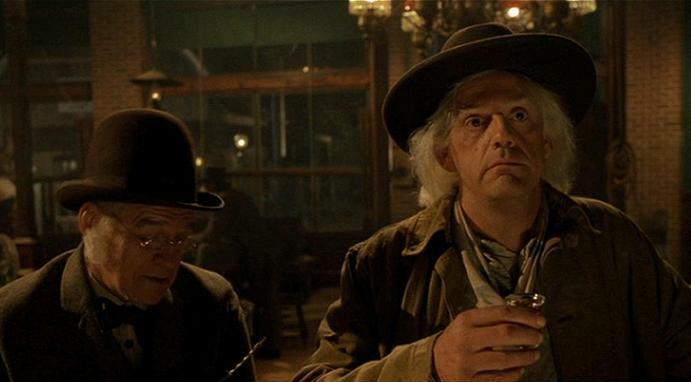 Taking place in the old west, Back to the Future III holds this uneasy status of being part of a legendary trilogy yet being one of the least discussed among fans. Unlike the previous 2 installations, Back to the Future III focuses more on the events that shape the future (or present depending how you see it) of Doc Brown. We find Marty and Doc thrown into a myriad of unexpected bumps in their journey that of course make the mission a bit more challenging than originally planned. The good; well. It’s still Back to the Future, right? Sure. Like the previous two, Back to the Future is not just about the characters. In this final chapter, we get to see the beginnings of the Hill Valley world. Those who pay attention will be rewarded by catching the humble beginnings of landmarks like the car dealer, the courthouse, and the Eastwood Ravine. One of the most memorable moments of the ending is Doc Brown’s tribute to Jules Vernes in the form of his western time travel vehicle. He returns to present day in a marvelous steampunk train that I never fully appreciated until today after seeing folks at conventions wearing elaborate costumes of the genre. 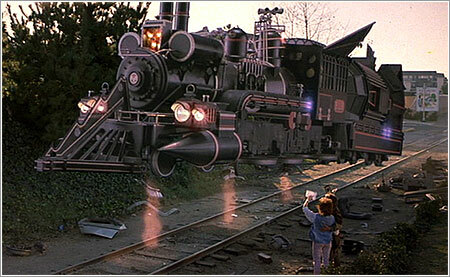 The ending of Back to the Future III left us yearning for more steampunk. The bad; does anyone care about westerns? While it’s fun to see even early incarnations of the Tannen and McFly families, we’re reminded at just how wild the west was. Just imagine if gun draws were an acceptable practice today with the addition of oversharing from every angle by any amateur with a phone. There’s nothing in this final movie that diminishes the appeal of the previous two, but there have since been a few questionable uses of Doc Brown for Gibson and Funny or Die. It’s hard not to feel a little embarrassed. Overall, we should be glad that the third was just good enough not to sour the love we have with Marty and Doc. While the repeated themes and bits work, it’s easy to become distracted with questions of how time works. But if blah blah blah changed in 1885, what else could have been effected in 1985? But wait… so there’s a time machine buried away years ago that no one came across? Hmm. Let’s just not think about it too much. 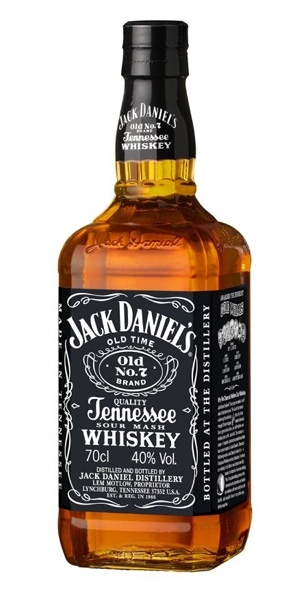 So rather than hurting your brain, just sit back and nurse a nice glass of whiskey on the rocks. Jack Daniels. Classic and accessible to all degenerates. You could also just take it straight up, but be careful not to knock yourself out like this guy. Doc Brown ponders the meaning of life just before taking a really bad shot. Just like last time, our friends; fellow contributor Eugene Abano, Dr. Q at Craft Beer Tasters and Cody from Three B Zine have something to say. But this time we’re also joined by me, Jen from Sounds in San Diego, and Zack Norris, go check out what they have to say. Also be sure to store the entire trilogy on UltraViolet if you haven’t already done so. It was added not too long ago and makes a great edition, especially if you have never seen them in high definition! Don’t know how? Check out our guide here. This entry was posted in Reviews and tagged back to the future, old review, steampunk on April 17, 2014 by Mark Azali. Starting today, September 8, 2011, Nike is auctioning off the 2011 Nike Mag. All proceeds will be donated to the Michael J. Fox Foundation for Parkinson’s Research. For 10 days, 150 pairs of the 2011 Nike Mag will be auctioned on their eBay website. 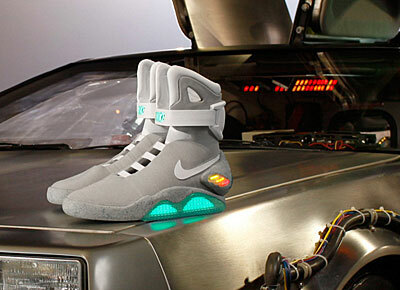 The Nike Mag is basically the same “future” shoe as seen in Back to the Future 2 movie. Granted it doesn’t have the cool auto-lacing shoe laces, it does feature an illuminating Nike logo on the front. Regardless, all proceeds are going to Parkinson’s disease research. You can start bidding on their eBay auction here. For more information please visit their eBay site Back For the Future. This entry was posted in Off-Topic and tagged back to the future, charity, michael j fox, nike, nike mag, parkinsons disease on September 8, 2011 by Danny.